RUSH: From the U.K. Daily Mail: “‘Crooked Hillary is the worst (and biggest) loser of all time. '” This is a Donald Trump tweet. 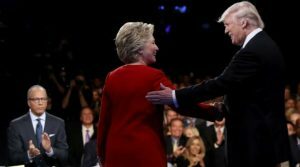 He tells Hillary to get on with her life, as she questioned the legitimacy of the election and urges her to try again in three years. And you remember how the entire Drive-By Media and Democrat Party and, hell, some Republicans descended on Trump and they accused him of undermining our great and vaunted Democrat process? Donald Trump once again was posing the greatest threat to democracy that any of us had ever seen in the modern era. Because he was saying he would not accept the outcome of the election. You get the picture. That’s what they wanted, and they didn’t get it. And they went around talking about what a great threat Trump’s refusal to acknowledge that he wouldn’t accept the results posed to our great democracy. Remember how horrified Hillary pretended to be? She actually said, “That’s horrifying.” And yet here we are a year later, and she still hasn’t accepted the results, and she’s the one undermining our democracy by claiming that it was rigged and there was cheating and that there was collusion. Maybe they could create a new PAC or nonprofit called Move On. Oh, wait, there already is one. I’m sorry. You know what the original Move On was? The original MoveOn.org, “Stop all this about Clinton and Lewinsky! It’s time to move on. It’s time to move on from Clinton and the women. It’s time to move on from Clinton and Lewinsky. It’s time to move.” And that’s the origins of MoveOn.org. “Trump reacted Saturday to an interview Clinton gave to Mother Jones. Clinton said that Trump’s election victory was tainted because of voter suppression –” Oh, oh, whoa, whoa, wait. Voter suppression? We got a new one! They’re throwing a new thing in the mix here. Voter suppression? And alleged interference by Russia. So Hillary is now citing voter suppression along with Russian meddling, even though there isn’t any evidence of that, either. You know what? I won’t be surprised if somewhere down the line she blames global warming. It’s about the only thing that she has left out.